Good Morning Text Messages for Him or Her | Love SMS, Greetings Messages, Motivational SMS, Birthday SMS, and More... I love waking up in the morning with you right next to me. I love you so.  In case you still didn’t know this, I love falling asleep in your arms and waking up beside you. Good Morning, handsome.  Good morning, handsome man. I’m sending big hugs and sweet kisses your way. I love you, and I hope you have the most amazing day.  Every morning that I wake up, I just fall deeper in love with you.  You are my most beautiful dream come true. Thank you for coming into my life. I love you. Have a wonderful morning!  You will always be the best part of my day. Thank you for loving me. Have a beautiful morning, my love!  The best thing about waking up in the morning is knowing that I get to spend the whole day with you. Happy Morning!  You truly are the man of my dreams. Good morning my love.  Good morning to the sweetest guy a girl could ask for. You are the light of my life.  There is no one like you in this world. Good morning.  I hope your morning is as bright as your smile.  Here are some hugs and kisses to start out your day. Hopefully, they will last until you see me later today.  Good morning my sweet prince.  Good morning to the hottest man alive.  Knock, knock sleepyhead! It’s time to wake up!  Hey, hot stuff!!! Wake up! Miss you so much. Other girls need makeup to feel confident; I just need you.  Wake up the love of my life!  Hey, handsome! How you are doing this morning?  Waking up every morning knowing that you’re mine, brightens up day more than sunshine ever could.  Wishing best of the morning to the guy who always fulfills all my desires and made my life happier and joyful.  Loving you is like a new day. It is fresh and true.  Get up! Get up! An amazing day is about to begin. Have a nice day my love. Good morning!  My sweet pie, my sugar bunch, my pumpkin roll, my munchkin, my love it’s time to wake up! Good morning!  I love you with every breath of my life. Wake up, my love.  Were you a coffee bean in your past life? Must be, because I can't start my day without you. Good morning my Love!  Just the thought of you brightens up my morning.  Good Morning, Have a Beautiful Day!  It doesn't matter what day of the week it is. As long as we are together, it will always be a beautiful day.  I went to sleep last night with a smile because I knew I'd be dreaming of you... but I woke up this morning with a smile because you weren't a dream. Good Morning, baby!  Good Morning, Honey! I love you!  May you begin this day with a smile on your face, and with happiness for your soul to embrace. Good Morning my love.  Have a Beary Good Morning!  Good Morning My Sweet Love!  Sending a warm wish your way, may it brighten your day like the morning rays. Very good morning!  I love the sunrise because each morning, it's a reminder that I have another day to spend with the man of my dreams. Good morning.  Good Morning, I miss you! I am waiting for you!  Wake up sweetheart! Good morning, I love you!  You are my sweetest dream come true. Good Morning.  May you start this new day with your beautiful smile and happiness.  If u cannot get someone off ur mind, maybe he/she is supposed to be there. Remember, the mind can recognize what the heart is trying to deny. Good Morning!  Eyes are not meant for tears and heart is not meant for fear, never get upset but always cheer bcoz u r the 1 who can make people smile for years. Good Morning!  Life is a rope that swings us through hope. Always believe that today is better than yesterday & tomorrow will be much better than today... good morning babe.  Family, friends, health & time don't come with a price tag! It's only when we lose them that we realize their true value. Good Morning!  With petals of roses, pal full of holly water, light full of sun, fragrance of flower and grass with dew. I wish u a very special Good Morning!  Good morning dear. I hope u have a wonderful day.  God has added one more day in your life not necessarily bcoz you need it but because someone else might need u. Good Morning!  Live it! Love it! The day is yours! Gud Mrng!!  I wish a good morning to the person whose kisses are the reason for my happiness and whose hugs make my life priceless.  Every day in my life is perfect because it starts by wishing you a good morning. Have an amazing day baby.  Wishing you a good morning and a nice day!  Look outside the window, sun rising for u, flowers smiling for u, birds singing 4 u, b'coz last night I told them to wish you u good morning!  Lovely wishes 2 a lovely person on a lovely day.  I'm thinking of you and wish you a great day I want the best for you and hope things go your way.  You have a cute yawn on your face, a cup of coffee in your hands. All that remains is a good morning message from me. Have a great morning!  I woke up one day and thought something was missing. So I got up from my bed, grabbed my cell phone and sent you a morning greeting. Good Morning!  Did you feel a little warm in the morning? I sent you a couple hugs in my thoughts! Good morning! 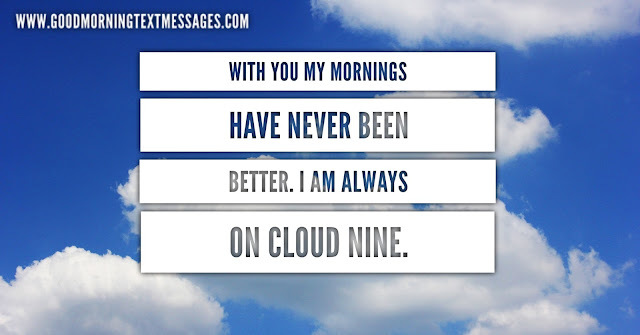  Share your favorite "Good Morning Text Message" with us. What's the most romantic morning text you ever received? Next articleHow To Access Windows 10 Sticky Notes From Anywhere?